Available in either paper or laminated! The World Classic is highly detailed using crisp clear text, a vibrant color palette and attractive terrain shading. 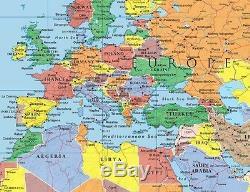 Perfect for home, office or classroom, this wall map of the World is informative and eye-catching. The World Classic stands out from others with its beautiful shaded relief of our world's land and oceans! Stunning and breathtaking for those who want the best! 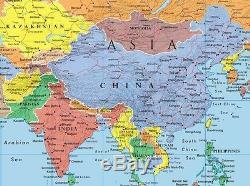 At 48x78 inches - the World Classic is the largest one-piece wall map in print today!! Physical Features and Terrain Shading. Detailed Scale: 1:23,500,000. FOR THOSE WHO ONLY WANT THE VERY BEST!!! NOW AVAILABLE IN PEEL & STICK!! - Peel & Stick is a new revolutionary self-adhesive format which can be repeatedly removed and reapplied without losing its sticky properties. Adheres to almost any surface, including brick, stone, cement board, wood laminate, wallpaper, foam board, glass, tile, paint. The map can be removed at any time and relocated or stored using the backing paper supplied. NO screws, rails, nails, pins, hooks, strings, tape or glue are required to mount this product the special adhesive backing does all the work. Simply peel your map and stick it! Peel & Stick products are printed with fade resistance inks on a specially designed 3-layer vinyl, for the perfect clarity, color reproduction and durability. Peel & Stick will not tear or crease and feel like a high-quality map. 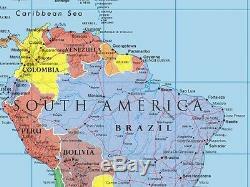 Want to re-locate your map? Simply peel and replace on a different wall, or re-apply to the backing paper supplied for transport or storage. Now you can display your map where you want it, when you want it. Peel & Stick will change the future of wall maps and wall murals worldwide and we're proud to be leading the way!! 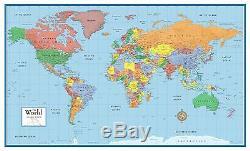 The item "48x78 World Classic Elite Large Wall Map Poster and Mural" is in sale since Monday, April 28, 2014. This item is in the category "Home & Garden\Home Décor\Posters & Prints". The seller is "swiftmaps" and is located in Largo, Florida. This item can be shipped to United States, Canada, Denmark, Romania, Slovakia, Bulgaria, Czech republic, Finland, Hungary, Latvia, Lithuania, Malta, Estonia, Australia, Greece, Portugal, Cyprus, Slovenia, Japan, China, Sweden, South Korea, Indonesia, Taiwan, South africa, Thailand, Belgium, France, Hong Kong, Ireland, Netherlands, Poland, Spain, Italy, Austria, Israel, Mexico, New Zealand, Philippines, Singapore, Switzerland, Norway, Saudi arabia, Ukraine, United arab emirates, Qatar, Kuwait, Bahrain, Croatia, Malaysia, Brazil, Colombia, Costa rica, Dominican republic, Panama, Trinidad and tobago, Guatemala, El salvador, Honduras, Jamaica, United Kingdom.